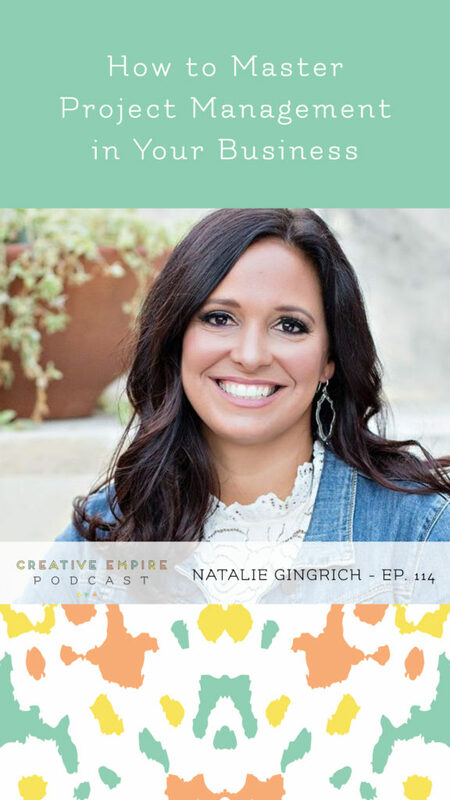 This Creative Empire podcast episode Reina and Christina interview Natalie Gingrich. Natalie Gingrich is a quintessential, Type A leader who thoroughly enjoys helping her entrepreneurial peers move their businesses into action with her love of project management. In this episode Natalie shares about what a project manager looks like and how to create a solid framework for your business. The trio then discuss how to prioritize in your business and how to park certain ideas to implement later. Lastly, Natalie dives into discussing and gives tips to hiring your first team member, such as writing down all the things that you aren't excited about doing in your business, and how to look for the perfect fit for your business. Natalie Gingrich is a quintessential, Type A leader who thoroughly enjoys helping her entrepreneurial peers move their businesses into action with her love of project management. After 15 years in a Fortune 150 company, she uses her tremendous drive, education, and professional experience to serve those in a space known for creative and visionary thinkers. She combines her passion for people, with simplified processes and practical, project management to create authentic movement in business. As a mother of two- and a native of Texas- her heart is big and eager to serve. You can gain a glimpse of how she manages her (and her team's) tasks at www.NatalieGingrich.com/productiveweek. We manage your people and processes so you can get back to managing your vision! Did you love what you've heard? Did you love what you've heard? Add this graphic to your Insta Story!